The report accusing Egypt of restricting free speech, arresting political dissidents and undermining democracy, The Associated Press (AP) reported Monday. The six-page ridiculous report, quietly submitted to lawmakers last month, said that “except in rare instances, police and security forces have not been held accountable for alleged human rights violations,” the report said, objecting on Egypt’s decision to expand the jurisdiction of military courts to try civilians. The police agent’s name is Ahmad Hamdi Shams from Kufr Al-Sheikh who was recruited to infiltrate ISIS. Obama cares less about him. But he wants Al-Sisi to give more rights for the terrorists who murder police officers while Egypt is now surrounded by terror on every side. It is not only Libya, but the Sinai with Ansar Bayt Al-Maqdis that joined ISIS. 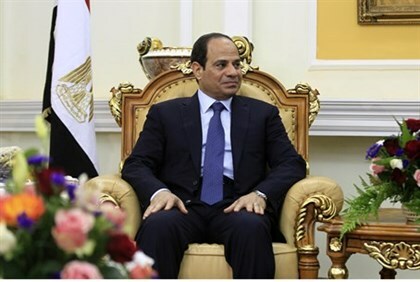 This means that Egypt is no longer facing only the Muslim Brotherhood, but a coalition of forces which holds the banner of political Islam which seeks to destroy the Egyptian, Iraqi and Syrian states. All this while Obama’s ridiculous report wants “adequate medical care” and “air conditioning” for members of ISIS and the Muslim Brotherhood terrorists. Perhaps the next step is for Obama to submit another report to congress demanding he expands Obamacare into Egyptian prisons? Hail Obama, the defender of terrorists.